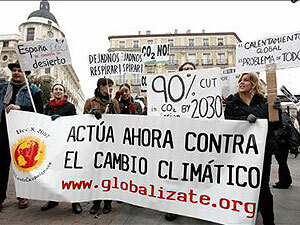 Hundreds of campaigners have marched through Glasgow in an attempt to raise awareness of climate change. 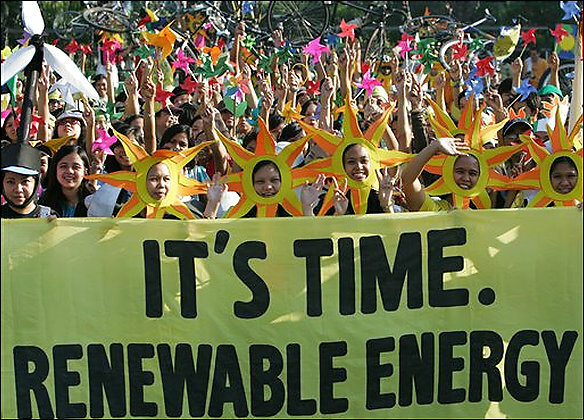 Protests also took place simultaneously in more than 60 countries to coincide with the UN Climate Change Conference in Bali. 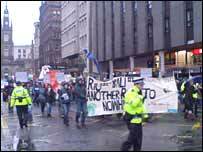 Organisers of the Climate March 2007 in Glasgow said they wanted politicians to use radical solutions to combat the problem of climate change. About 300 protesters marched from the city centre to a rally near the Clyde. They were accompanied by a campaigner dressed as a polar bear, and a giant iceberg with a polar bear on top, to highlight the problems of climate change. NUSA DUA, Indonesia: Indigenous people from around the globe said yesterday they were being excluded from key international climate change talks, when it was their homes, livelihoods and culture at risk from global warming. 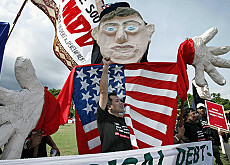 Surrounded by demonstrators wearing paper gags reading UNFCCC (UN Framework Convention on Climate Change), Marcial Arias, one of Panama’s Kuna people, made a passionate plea for the world to listen. “There are no name places for indigenous people, there are no seats for indigenous people,” said Arias, referring to a UN conference in Bali, Indonesia on future plans for fighting climate change. “They want us to beg on our knees to be given the floor, but we have the right to participate,” he said. About 20 indigenous people from countries including Nigeria, Kenya, Bangladesh, Samoa, Mexico, the Philippines and Indonesia – some in traditional dress—joined the protest outside the conference centre. “We have our culture to protect and our language to protect,” said Alfred Ilenre, from the Edo group in Nigeria. “The convention on climate change should not isolate indigenous people… If we are not allowing them to have their say, it is a crime against humanity,” said Ilenre. « En Madrid, la manifestación la han secundado unas 200 personas. Mario Cuéllar, presidente de Globalízate, una de las asociaciones organizadoras del evento, ha defendido la necesidad de que los políticos apoyen un tratado de reducciones que sea mucho más ambicioso que el de Kioto. En Nueva Zelanda han formado un mosáico humano gigante (AP). Des centaines de personnes ont manifesté samedi à Bali pour insister sur la «dette» des pays riches envers les pays pauvres en matière climatique. Les premiers seraient « largement responsables » du réchauffement.